I don’t care if summer is “officially” over, I am determined to enjoy this summer cocktail until I stop being sweaty. Which will be, like, sometime in February. My Pimm’s Cup Quest kicked off at the beginning of the summer when The Manifest changed up their cocktail menu and added the appropriately seasonal Pimm’s Cup, seen at right. 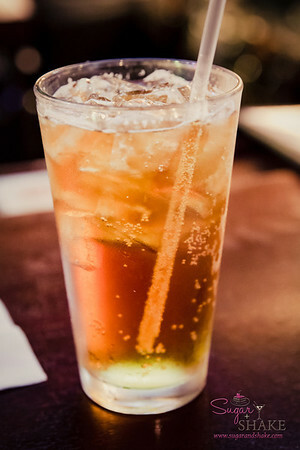 The Manifest’s Justin Park gave me a mini Pimm’s lesson, informing me that the “No. 1” in Pimm’s actually means something. (As opposed to Heinz 57, which is largely BS.) The “No. 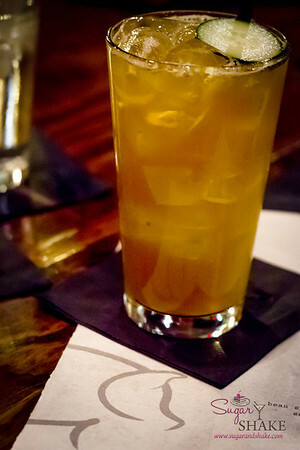 1” formula for Pimm’s is gin-based, with a citrus and spice flavor. It’s the only one of the original six formulations readily available. No.’s 2 through 6 are based on other spirits—whisky, brandy, rum, rye, vodka. Reportedly, No. 3 (brandy-based) exists in a seasonal version and No. 6 (vodka-based) in limited production. The rest have been phased out. And according to the Pimm’s official website, there is now a Blackberry & Elderflower formulation, which I would love to get my hands on! 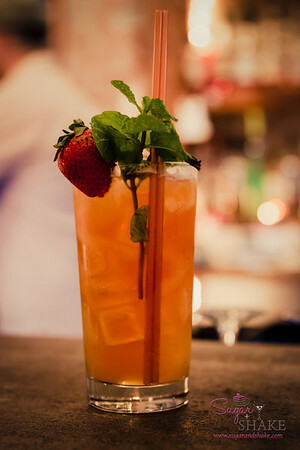 Justin gets full marks for his fancy garnish—the best of the Pimm’s Cups I sampled. I also enjoyed his use of Gosling’s Ginger Beer as the fizzy component. It had a nice bite to counter the sweetness of the Pimm’s. Next up, I sampled Pimm’s Cups at Murphy’s Bar (below, left) and Lucky Belly (below, right). Unsurprisingly, the Pimm’s Cup is not on the menu at Murph’s, but we were there visiting ace barman Jonathan Schwalbenitz; I spotted the bottle of Pimm’s on the bar and asked him to make one for me. Lucky Belly had the Pimm’s on their cocktail menu. Both were very simple renditions with no garnish from Jonathan (not that I blame him—garnish is not an Irish pub thing) and a simple cucumber slice at the Belly. Plain lemon-lime soda in both, as far as I could tell. Serviceable and refreshing, but on the sweeter side. At Pint + Jigger, we plopped down at the bar and I informed Dave Newman that I was going around town tasting everyone’s Pimm’s Cups. He made me his version, which was the very first drink he ever won a cocktail competition with. Dave was the only one to muddle anything in his drink—cucumber and angostura bitters. He also used ginger ale and ginger beer—Bundaberg instead of Gosling’s. 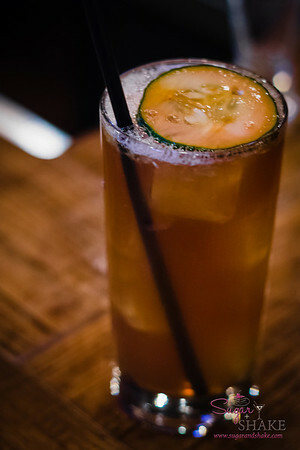 As a garnish, a cucumber slice doused with bitters. Less fancy than Justin’s garnish, but I’ve never known Dave to get crazy with the garnishes anyway, so it’s true to his style. NOW I was done with my Pimm’s project, I thought. (Obviously, I did not make this a thorough and exhaustive quest, since there are other places that I could have made the effort to go and visit. But it’s hot. I just want to go to the closest air-conditioned bar and have a nice drink. That’s my excuse.) 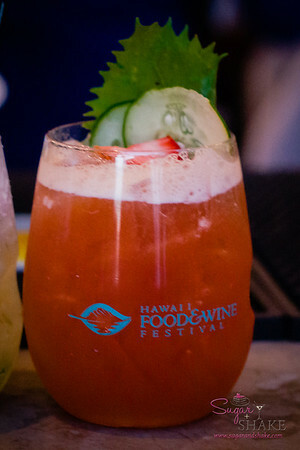 However, when we attended the O‘ahu kick-off event for the Hawai‘i Food & Wine Festival, Under the Modern Moon, mixologist Chandra Lucariello was mixing up a twist on Pimm’s Cups! Her drink was called the Bonsai and in addition to the Pimm’s No. 1, it included strawberry purée, cucumber-shiso-yuzu juice and ginger beer. Chandra also made hers pretty—I would expect no less; girl always looks fabulous and so do her drinks—and it was sooooo refreshing in the heat. It was a lovely shade of red, due to the strawberry purée. 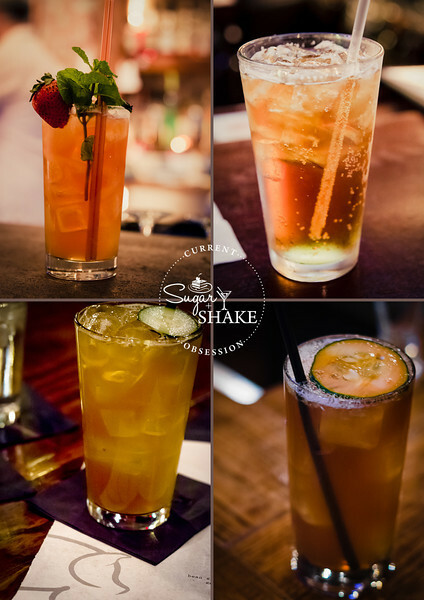 So there you have it, six different Pimm’s Cups, no two alike. It’s still hot. Go get—or make—yourself one.